This painting by John Tunnard was created a year before the end of WWII. Though Tunnard opposed the war, he worked as a fisherman for a short time before volunteering to support the coastguard during the war. 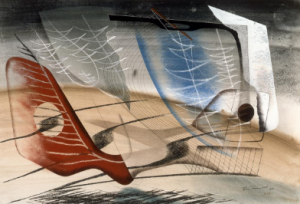 The shapes in this painting appear to show a ship–the white scribbles look like masts. This painting was perhaps the result of his experience during the war. Aside from being a painter Tunnard was a jazz drummer. He was inspired by the rhythm of the music, which he incorporated visually into his paintings.